This document sets out some history regarding the POV-Ray codebase, the license that covers its use and distribution, and how the company Persistence of Vision Raytracer Pty. Ltd. - which currently distributes POV-Ray - comes into the picture. POV-Ray is based on DKBTrace, a raytracer originally written by David K Buck in 1987, and subsequently co-developed by David and Aaron A Collins between 1988 and 1991. In 1991 David and Aaron made the decision to allow the source code of DKBTrace to be used as the basis of a new raytracer, which was to be called POV-Ray. The development of POV-Ray began with David as the first team leader - also known as 'team co-ordinator', which is the term used today - heading up a group of programmers who were dialling in to the then-popular Compuserve online service. Even at that early stage, the Team's attitude towards the use and re-use of the source code they produced was clear - an approach that has persisted to this day and is formalised in the POV-Ray license. This approach is strongly influenced - and derives from - David's original rules covering his source code. In a nutshell (refer to the current license for the full terms) David allowed DKBTrace (and thus POV-Ray, as it is based on DKBTrace) to be used freely by end-users, and freely distributed, as long as it was not sold, included with a commercial program, or used in certain other ways that contravened the concept of the software being freely available. He also allowed his source code to be used by other programmers to, for example, port the program to other platforms, add new features, or create derivative works (as long as they were fully functional versions of the original program). However, in order to use the source in this way, the programmers involved had to agree to his terms, which included the condition that the modified source code had to be released if the modified program made from it was released, and that the modifications themselves be placed under the same license as that which covered the program. This condition meant that the team co-ordinator could manage the project without having to continually refer license matters to each contributor. David Buck has provided a written statement regarding the above, a copy of which may be read here. Rare and limited instances where authors explicitly granted permission for pieces of their code to be placed into the DKBTrace or POV-Ray codebase verbatim, without any need for the original author to otherwise deal with the existing source. Code that has been introduced as a result of a programmer taking a previously-existing version of the source code and working with it in order to be able to create the code that they eventually contributed. In order for them to have been able to do that legally, copyright law requires that they comply with the conditions placed upon the source that they obtained. Therefore, it is the position of the current developers of POV-Ray that the team co-ordinator, by virtue of the above, has the right to administer the entire POV-Ray codebase under the terms of the POV-Ray license. As the FOSS (free and open source) industry matured, many projects took the route of incorporating in order to provide a recognisable legal entity to hold intellectual property rights, and in this respect POV-Ray was no different. It was decided during the development of POV-Ray v3.6 that prior to its completion a legal entity would be established to hold rights and formally release the software. Consequently, starting in January 2004, Persistence of Vision Raytracer Pty. Ltd., a company registered in the state of Victoria, Australia, began receiving assignment documents from a number of the primary developers of the program, including original creator David Buck. By the time that POV-Ray v3.6 was officially released in June of that year the company had formal ownership of approximately 50% of the POV-Ray codebase. A sample of one of the above assignments can be viewed by following the link from David Buck's name. In 2005 a decision was made to further clarify the legal rights of the team co-ordinator by contacting both the above developers and a number of others who had not been contacted in the first round of assignments mentioned above. As a result of this round of contacts the project received new declarations demonstrating that the developers always intended that their contributions be managed according to the spirit and intent of the POV-Ray license. Two samples of the above declarations are available, linked in the above list. 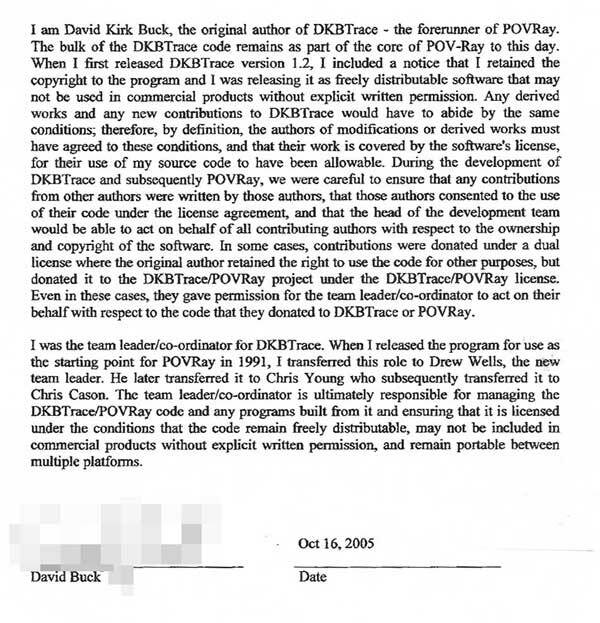 The developers who have already provided declarations or assignments account for a large proportion of the POV-Ray source code base (in our estimation around 90%), and includes all of the primary developers to have worked on what is now the POV-Ray codebase since the day in 1987 that David K Buck sat down to write the first lines of what would become DKBTrace. Given the amount of time that has gone by and the difficulty of locating some contributors, the current team is quite pleased with this outcome. [N.B. a 'primary developer' is defined as a person listed as such in the documentation shipped with the current or any past release of POV-Ray]. Some prior versions of POV-Ray had code that was contributed by Intel Corporation pursuant to an Optimization Agreement. This code remained the property of Intel Corp., however the POV-Ray project was granted indefinite, irrevocable, world-wide rights to include it in POV-Ray and place it under the POV-Ray license. This therefore permitted it to be used in derivative works and other activities, provided the works or activities were themselves permitted under our license. Given the success seen so far it is the team's intention to continue working through the list of developers for whom we do not have contact information in order to locate as many more as possible. This will include the holding of a public drive.